Up next we have a Leonardo 7 inch action figure based upon his appearance in the 1990 movie Teenage Mutant Ninja Turtles by NECA. Now if you're a fan of the movie you may have been confused by the song Turtle Power by Partners In Kryme. In the song, it says, "Raphael, he's the leader of the group" but we all know that Leo is the leader of the group. 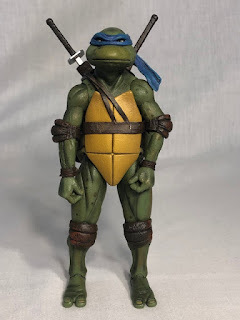 This 7-inch scale Leonardo is based upon the 1/4 scale TMNT movie figures released a few years ago by NECA. As I don't have the 1/4 scale, Leo, I can't compare them but from what I can see and based upon Donatello, I have both the 1/4 and 7-inch scale, there isn't really much of a difference. Like the other turtles, this Leonardo looks like a carbon copy of how he looked in the movie. NECA was even able to hide most of the joints, which I admit is easy with all the turtles' wraps and pads, but it helps with the realism. Leonardo comes with 30 points of articulation just like his brothers. 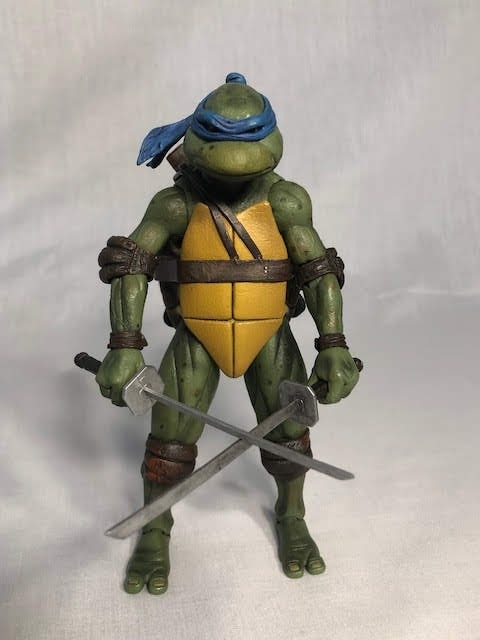 Leonardo has his sword sheaths built into the sculpt and can't be removed which is a little bit disappointing. 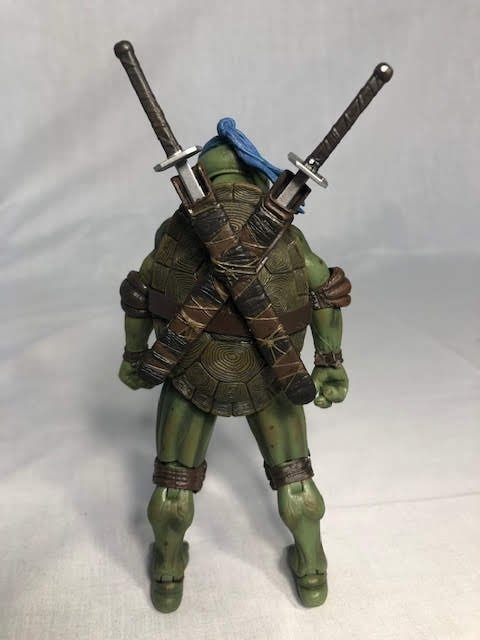 The other turtles also can't remove their belts but Leonardo's sword sheaths are pretty big and it will make some poses hard. 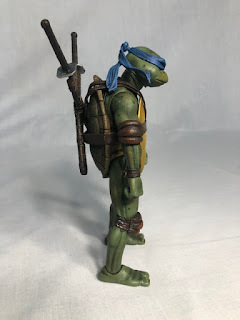 After what happened with my 7 Inch Donatello, I will not be changing out Leonardo or any of the other turtle's hands because if I lose one of the hands that hold onto the weapons I won't be very happy at all. 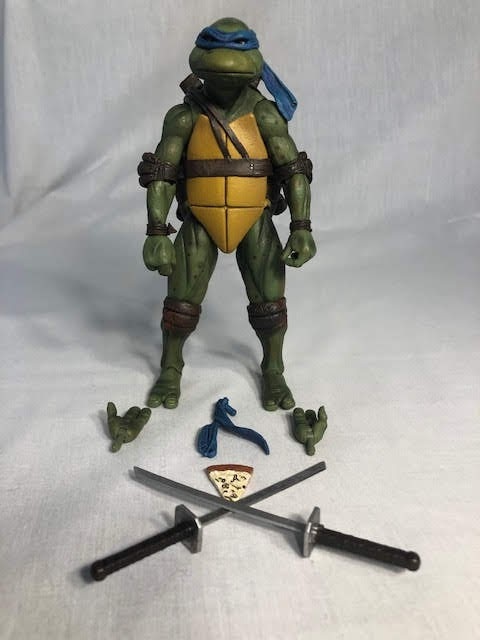 Like the other turtles, Leonardo comes with two sets of hands, two katana blades, a second headband, and a slice of pizza. I like the way the swords look but I'm a little afraid of them breaking as they are a bit flimsy. 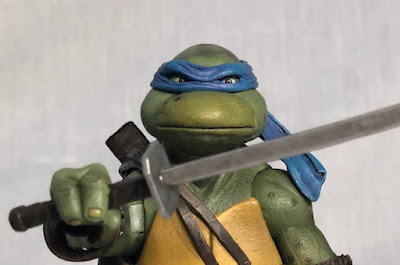 The sculpt for Leonardo's head is my favorite part of this figure as its really a great likeness. The Donatello head is a good likeness as well but I would have picked a different shot to base the sculpt by. For Leonardo, they picked a perfect shot to base his head on. 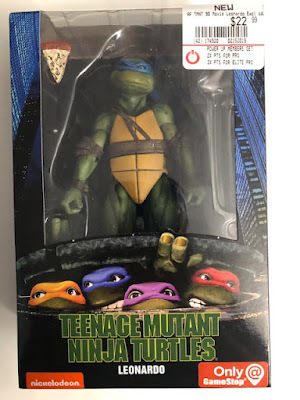 The only issue with these figures is the fact that you can't get a lot of flexibility out of these turtles. This is less of a toy problem and more of making a hard plastic toy based upon a latex movie costume. If you look on the back of the boxes these figures came in you'll see the four turtles posed in a pose that was originally on the cover of the VHS box. It is impossible to pose Donatello in the same way without putting the Donatello toy at a lower hight to mimic him on his knees like in the real picture. Trust me I tried to recreate it with the figures and you cant. 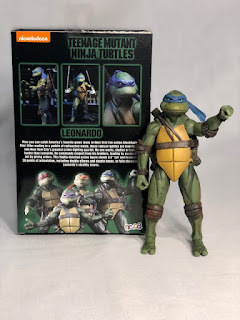 I'm very happy with this action figure and out of the three I've already posted about he is my second favorite after Raphael. It's a great likeness and nothing has broken so far so I have to give this Leonardo an 8 out of 10. 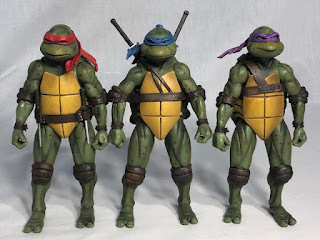 If they are still available these turtles are a Gamestop exclusive and cost $22.99 and I recommend you pick yourself up a couple before they are sold out and selling for much more on eBay.